It bothers me alot my therion DNA 75 is brand new but when i opened it to use it the first thing that bothered me is that there is no VOLT reading on the screen instead there is the ---F and KA at the bottom. Im not sure if this is normal but i have been using other DNA 75 and DNA 200 mods and i dont see this problem. Can someone tell me how to fix this. I just want to the normal setup which is Ohms VOLTS and amp. Please see attached pic for my problem. welcome to the forum markace21. you have to go into the escribe program from a computer and change your screen display options. you can't do it from the mod, sorry. once you download the escribe program you can set the device up however you want it. i recommend that you watch the escribe tutorial video first before using escribe. be sure to post any questions you might have, here. Thank you very much for the reply. Ill try to look up on youtube on the video on how to change this through the computer and apply it. Hopefully it will work. Hi. Hehe, i saw it too and it is not a "problem" as you called it. Well I can tell you what I did, it will probably sound confusing but I opened Escribe v1.2SP3 up with out the device attached and I went to the Power Ctrl profile which I believe is profile #6 then I saved that profile and named it ES Power. 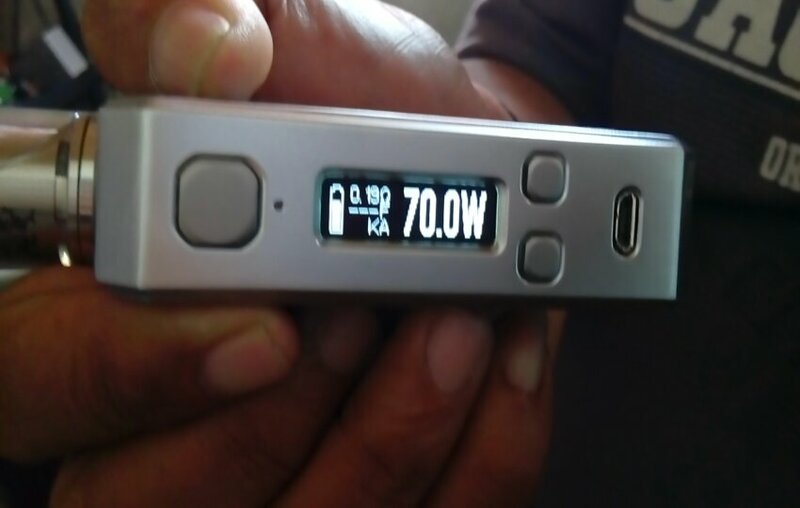 Then I attached the Therion and went to the Watts profile provided by Lost Vapes and loaded the profile from Escribe that I saved there and replaced the one from Lost Vapes with the standard one from Escribe and it takes care of everything. The Escribe profile has the voltage in the 2nd spot just for that profile without changing your other profiles. That's probably about as clear as mud. I would say watch the tutorial and maybe Busardos review on the DNA200. I replaced a lot of Lost Vapes profiles with either Escribes or Steam Engines but Escribes Power Ctrl profile is better then Lost Vapes. I should say if you are not comfortable doing this don't until you have a better understanding of how Escribe works in conjunction with your Therion. Once you hook your Therion to Escribe it will download all of your stock settings so If you screw up you can always go back to the original configuration just like with a computer when you restore your system to original. Like I say if your not comfortable doing it don't come back here and ask questions, there are a lot of guys here with a lot more experience then me that will help you. Everybody does things differently I guess. When I get a new DNA device the first thing I usually do is hook it to EScribe and after it downloads the settings into EScribe I immediately save the .ecig file to my computer using the File/Save As command in EScribe. This creates a saved .ecig file so I can reload it as needed. Also after I set up profiles and etc. and after uploading them to the device I save that .ecig file also so it can be reloaded as needed. Others may just let EScribe download the settings into EScribe and then they make changes and upload them into the device without saving an .ecig file to the computer. Listen to him he knows a lot more then me I'm a newbie at this Escribe thing he's not, I just told you what I did and it was a hit or miss process for me. I only use 2 different wires and sometimes will use power so I'm not even sure if I have the original settings and for me I wasn't that impressed with them anyway. The profiles in Escribe were better to me then Lost Vapes and Steam Engines even better in some things. I never thought of doing what he said to do now maybe I should have. Learn something everyday about these things. That's what I mean about asking questions. Like I said there are guys that know a lot more then me so don't try something you are not comfortable doing. Thats the fun part about these you do learn something everyday.